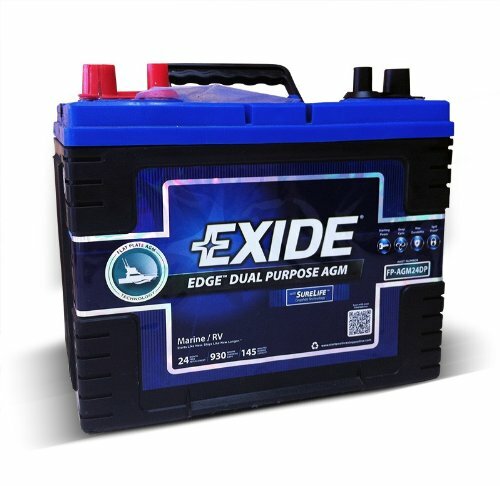 When I want to know exide battery review, I saw, many users consider Exide Edge FP-AGM24DP to be one of the best batteries for their motor needs. I have used many batteries over the course of my trolling motor, and I can say I will not think twice before choosing this battery as a replacement. It does not spill the electrolyte, which is a significant advantage when trolling in rough waters where you may accidentally tip over. I also enjoy the fact that I can ride at any angle without worrying that I am almost spilling my battery’s electrolyte. When trolling, excessive vibrations are expected, that is why I prefer the Absorbed Glass Matt feature; it sticks on to the cell plates, and holding them into place. That makes them resistant to vibrations and shock. That is one of the features that most wet batteries do not have. Having experienced its benefits, I thought I should share some of my observations by writing this review. The Absorbed Glass Matt enables this marine battery to absorb shock as well as withstand vibrations. The AGM not only soaks the electrolyte and spreads it evenly over the plates, but also holds the plates firmly in place. That makes this one of the best batteries to use when trolling with powerful motors. The lead alloy makes this battery achieve very low internal resistances and weight that are unmatched by most batteries. The low internal resistance makes it easy to quickly charge the batteries without the battery overheating. The lightweight lead alloy also makes this battery light in weight than conventional lead acid batteries. The compact rectangular shape is ideal for packing the batteries together. It allows you to pack them closely together when setting up a power bank. This battery can supply a cranking current of 775A which is more than enough to crank a size-able motor at zero degrees. That is why this battery is considered one of the best Starting battery. The reserve capacity of 25A for 145 minutes means that it can be used for trolling for over an hour. That is enough for traveling deep into the sea and back. Made of Absorbed Glass Matt, this battery is corrosion proof and vibration proof as well. You can use it without worrying about spills since the Absorbed Glass Matt soaks the electrolyte and contains it. The Exide Edge FP-AGM24DP includes a Graphite A﻿﻿dditive Technology, which protects the battery cells from damage and maximizes its life. This technology is found only in Exide batteries. The graphite additive works by reducing the size of the lead sulfate particles. These are the particles that cause the battery life to shorten when they get deposited on the cells. The Exide Edge FP-AGM24DP comes with a special vent system that allows the battery cells’ water to recombine and reduce evaporation. That helps to prevent cell dry-out. There are also pressure valves that ensure there is no vapor migration from one cell to another. This restriction helps to keep each cell’s water gravity constant. Alloy cells made by combining lead, calcium, silver, and tin, allow this battery to discharge and charge optimally. That is why it can withstand heavy charging current without damaging its cells. A continuous metal grid allows power to be conducted with least resistance. The battery will also develop fewer short circuits or none during its lifecycle. To you as a user, it means having more trolling hours from your trolling battery and a huge return on your investment. A recessed handle allows you to handle this battery with ease as you unpack and pack it. When you do not need it, you can safely lower it to its groove, and it will not get on your way. That allows you to pack several of them, one on top of the other or side by side. The handle is designed to match its compact shape and size. CCA at Zeros degrees 775A makes this the best trolling motor battery as well as cranking motor. You do not need to have one battery for cranking, and another one for trolling. With its power Reserve Capacity of 145 minutes, you are assured of a long day of trolling. Combined with its ability to charge quickly, you will always have a continuous supply of electrical power. Does this battery ship with dual terminals? Exide Edge FP-AGM24DP is a dual purpose battery and comes with two terminals for both starting and marine use purposes. No, this battery weighs slightly more than an Optima battery but a lot less than a standard lead acid battery. That is because it makes use of lead alloys instead of just lead metal. Does this battery ship by air? No, this battery cannot be shipped by land. Federal regulations do not allow it to be shipped by air, only by land and sea. This is a dual purpose battery. However, with only a reserve capacity for 175 minutes, you will need to have two of them if you wish to troll for three hours continuously. Make a point of buying two of them. That not only doubles your trolling time, but their lifetime will also be spread over a long period. 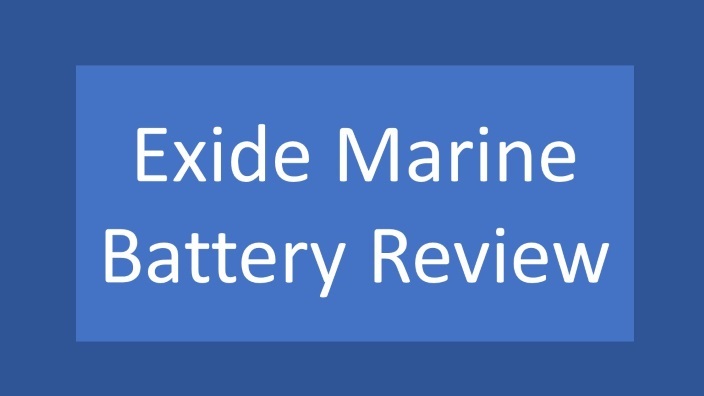 So finally we can find out, the summary of exide marine battery review: It is a dual purpose battery. It made of alloyed lead plates, an AGM, and is resistant to vibration and shocks. It can take a quick charge as well as deep cycling. It doubles up as the best starting marine battery for an RV. If you want the best battery for a electric motor that is affordable and high performing, this is the battery to buy. I like it because it can take quick charges. So you do not have to stop trolling at midday. Just give it a quick charge during lunch break and you are good to go. Buy it to enjoy its awesome trolling, starting, and RV powering benefits.